Today a candle with the scent can be purchased in any store, they are very popular. A pleasant fragrance in the room – one of the attributes of comfort, it will help to relax after hard work and better sleep. If you are wondering how to make a scented candle, read on. The most important is to choose the right perfume. Special designed for making scented candles. It can be as oil, and dry flavoring powder, very soluble in wax and gel for making candles. Buy perfume in specialized stores, because your perfume or essential oil can be easily ignited. Prepare a bowl in which you melt the wax or gel for making candles. Best of all, if this is glass deep bowl. Calculate what amount of material you will need for making the desired candle. Note that in the process of making 5-25% will completely evaporate, so bring a supply of wax or gel and melt it in a glass bowl in a water bath (if you would prefer, use the microwave). 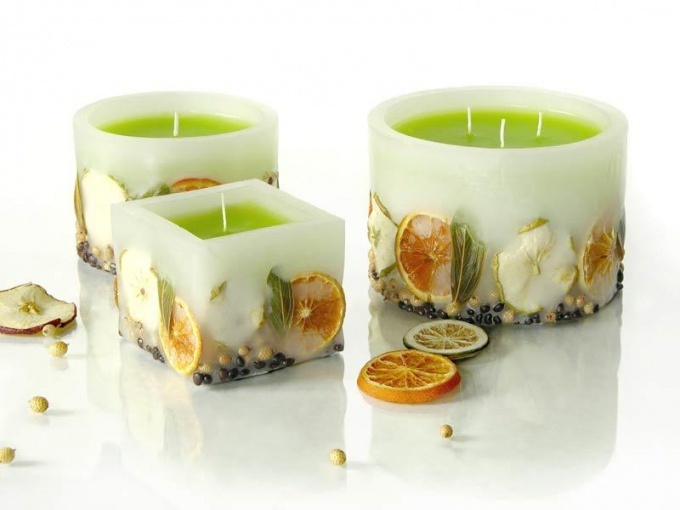 If you can't find a wax, paraffin or gel candles – finely chop and melt the most common purchase candles. When the wax or gel will eventually become liquid, add the fragrance oil or powder. Remember that they should not be more than 5% of the mass of the candle, otherwise the smell will be too strong. Pour the resulting liquid into a mould and insert the wick. The hole for the wick, you can do a ordinary orange stick after the solidification of the material, so if you would prefer. Put the mould for five minutes in a preheated oven. After time expires, turn it off and open the door. While the oven cools down – keep a candle in it, so it's better to harden and "set". So, the candle is ready. - You can add in melted wax colors, then the candle will become bright rich color. - Before pouring into the mold the wax, you can put rose petals or other decorative elements. To clean the utensils after making candles it is better, otherwise this process will turn into a very long, difficult and unpleasant task.